Mediterranean to modern, traditional to transitional, rustic, tropical, contemporary or even country … there are so many style designs that come to mind when creating your outdoor living space. While we specialize in custom patios that look original to your home, we can add flare in any direction that will leave you with something you love. You want to know how soon you’ll be able to enjoy your new outdoor style life? Use the handy guide below to know when your custom patio project needs to begin in order to be completed by these commonly requested dates. Factors such as material supplies and weather prevent us from guaranteeing completion dates, but we understand your desire for having projects completed for the important elements of your outdoor style lifestyle. We created this guide to give us the best opportunity to serve you by getting started in a timely fashion for your desired completion date. If for instance you are hoping to have something built by Memorial Day Weekend … NOW is the time to call and get the process started! To discover details of this charming traditional rustic covered patio, click the image below. It may be April, but at Texas Custom Patios we’re gearing up for summertime and all the festivities that brings! Pool parties, graduation get togethers, Memorial Day grill outs are all on the calendar, but first … let’s talk about our Easter celebration. It could be a huge family affair or maybe just you, your spouse and the crazy kids, either way, let’s make it memorable. Host a beautiful brunch without all of the hassle. Bake the tart shells for your chicken salad the day before; store in an airtight container. Warm them in the oven about 3 minutes. Make carrot soup the day before. Reheat, adding extra broth, if needed. We found so many incredible ideas, some DIY and some easily bought! Sweet little ideas like tying tulips with a simple pastel bow to your cloth napkins. We also discovered other adorable centerpiece ideas using carrots, dipped eggs and more! Check out our Pinterest page for hundreds of inspirational ideas that you can actually do! Southern Living has some fantastic videos with a step-by-step guide to creating a gorgeous centerpiece. Think outside the table and decorate the entire patio with potted beauties … click here for 108 creative container gardening ideas. If you don’t have a Texas Custom Patio just yet to enjoy on Easter, but are thinking about it … check here to be inspired by different projects of many styles! Just try to remember the day of any celebration that you have done all that you can do, so sit back and enjoy! Autumn air brings just another reason to get outdoors and live life. This Thursday marks the beginning of a new season … fall is here, and we are so excited to help you get in the spirit with style. 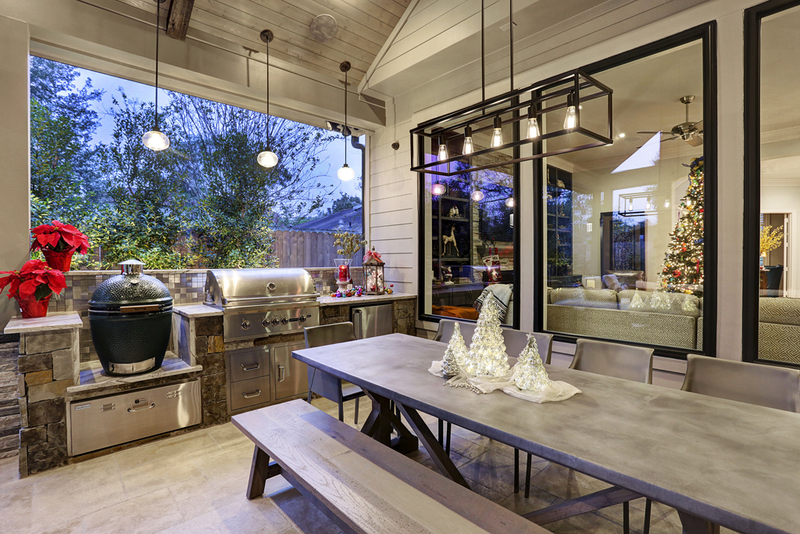 Creating a cozy outdoor living space can be both stylish and affordable. There are just a few fall decor must-haves when crafting an alfresco common area. Whether the illumination shines from a beautifully lit gas fire pit or groups of strategically placed candles … lighting both sets the mood and brings warmth to your outdoor experience. While traditional string lights are synonymous with the holidays you can also change up the style of string lights and make them a permanent fixture for a European vibe. Lighting in any fashion will add to the ambiance and can be done on many levels, flip the switch and add some light … you’ll illuminate the mood and the experience. Harvesting warm colors to match nature is exactly what you should do when designing your outdoor living space. Take a muted mustard color and make it pop agains a rustic red. Accent pillows, chargers, candles, throws, and rugs … these are all places where you can play with pigments. It’s fun to accessorize with color as it’s not permanent and easy to move around. Pick one area in the outdoor living space on which to focus, make it a place that really draws the eye. It could be as simple as an over-sized beautiful plant, a piece of art or even furniture (like the hanging sofa below). Make one part of the space something you’re proud of, something that makes you smile. It not only makes for a great talking piece, but can also make for a great picture backdrop. Within the outdoor living room or outdoor kitchen, have a place where 3 or more people can sit comfortably. Have a few billowy deep-set seats, a sofa with large pillows or even comfortable barstools to belly up to the bar. Your guests will enjoy the surroundings and remember the experience. Happy FALL, Y’all! Get outside … live life … enjoy! Click the image below to discover details about this gorgeous traditional covered patio in Allen. Click the image below to discover details about this modern stucco covered patio in Bellaire. LOVE our new outdoor kitchen and LOVE working with Ryan at Texas Custom Patios. This is our second round with this company…they designed and installed our beautiful covered patio last year, and this year we put in the outdoor kitchen. From design through implementation, every aspect of the project went beautifully. Ryan is a pro, and no detail or question is too small or seen as a hassle. He wants to make the client happy…that is his number one objective and it’s totally obvious every step of the way. And the contractors they bring in are the same way..they will get you exactly what you want, and will help you make great decisions along the way. We love entertaining and being in our outdoor space…more than we ever thought we would. Thanks Ryan and TCP! !